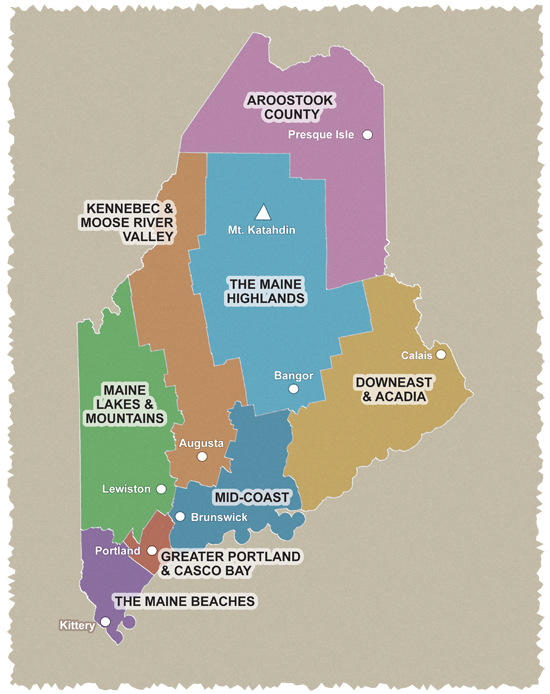 The 34-mile loop takes you up and down one of Maine’s many peninsulas. Site of the Popham Colony, Phippsburg was between 1607–1608 the first English settlement attempted in New England. You can visit Fort Popham and imagine what it must have been like to be part of that history. If you are interested in taking a break from biking, Popham Beach State Park, scenic Parker Head on the Kennebec River, and Morse Mountain Conservation Area are worth checking out. The 40-mile ride includes the scenic and historic features of Merrymeeting Bay and the Kennebec River. You’ll pass the Pownalborough Court House and see the historic village of Day’s Ferry. The scenery is magnificent on the pleasant 58-mile ride. So is the history of the area that stretches back to pre-Revolutionary days when Maine was part of the Massachusetts Bay Colony. Take time to explore the historic towns of Bath and Wiscasset, both of which offer graceful old homes and a variety of shops. On a clear day, you can see exceptionally fine views of the White Mountains, including Mt. Washington, as well as surrounding landscape from Blinn Hill. Starting point: The Bath Area Family YMCA is the starting point for all three rides. Restroom use is allowed. From the South: Take US 1 into Bath, take the Congress St exit, veer right. Travel approx. 0.1 mi, take a right onto Congress Ave. Go approximately ¼ mile to the blinking light; take a right onto Centre St. The YMCA is located on the left in approximately ¼ mile. From the North: Take US 1 to Bath, go over Sagadahoc Bridge, take first exit as you pass shopping center on right (Congress Ave/Richardson St exit). Veer right off exit onto Congress Ave, travel approximately ¼ mile to the blinking light; take a right onto Centre St. The YMCA is located on the left in approximately ¼ mile.